Are Weather Proof And Virtually Fade Proof. 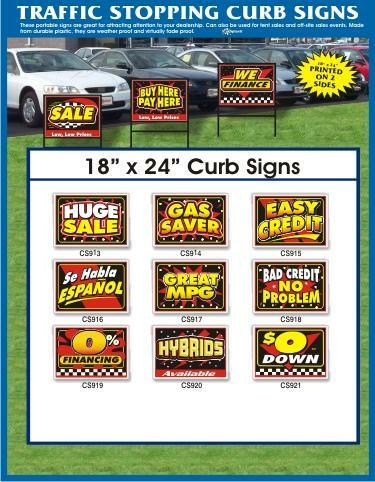 Curb Signs And Holders Are Sold Separately. Two To Choose From. Start With Your Ideas! We Can Print Anything You Want On These 4 Color Process, 13 oz. Heavy-Duty Banners. E-mail Your Artwork Today! 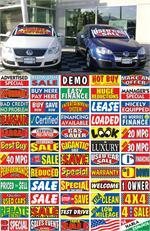 E-mail: autoadsales@aol.com. And Place Your Order Today. Burst Banners.. Available In Different Colors And Slogans.. Made Of Heavy-Duty, Reinforced, Weatherized Vinyl With Grommets. Four 5' Rope Ties Included For Each Corner. Printed On One Side Only. 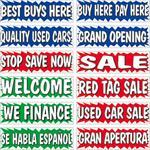 Under Hood "SALE" or "SAVE" or "open" Kit Includes 4 Sign Boards Spelling Out the Words SALE Or SAVE. Available With Red Or Blue Letters On White Background. Design Your Own Sign. This Unique Sign Lets You Create Whatever It Is You Want To Sell. Four Wet Erase Markers Included.